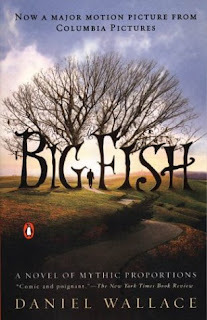 I didn't realize that Big Fish started out as a book but I found a copy of it at Goodwill last week and snatched it up. I watched the movie when it first came out back in 2004 and remembered thinking that it had a fun premise, focused on the art of story telling. The book made it appearance on the scene in 1998 and like many modern books, it caught the attention of Hollywood filmmakers for all the reasons I remembered it having been a good and entertaining film. Subtitled "A Novel of Mythic Proportions" it certainly is worth looking at how we tell stories and why we tell them the way that we do. The New York Times Book review says of this book, "Comic and poignant." (That's an incomplete thought but whatever.) It is both of those things. And absolutely depressing besides. I'm no longer surprised that Tim Burton produced the film, as although it does seem magical and inviting, it also has its rather dark side. As the father in this story, Edward Bloom tells his son (in the movie version), "We're storytellers, both of us. I speak mine out; you write yours down. Same thing." Big Fish is, in fact, the story of a story teller. Wallace presents Edward Bloom as a man who tells so many fantastical stories that everyone (but his own son) absolutely loves him. As Wallace says of Bloom, you 'couldn't not love him' if you knew him. However, I found myself disliking him anyway. The movie would want to paint him out to be a master story teller. But a master story teller only tells the truth. A master story teller would draw his listeners (or readers) in by drawing them towards something that is right and good. Wallace's representation of Bloom, while he attempts to make you like him, falls flat on its face. You can't really like Bloom because he was unlikeable. He used his stories as an excuse for bad behavior, and not for good. The basic premise of the story is this: Bloom lays dying and his son William, whom Bloom neglected his whole life, wants to have a serious conversation with his father. You see Bloom spent William's boyhood making up stories about himself that he wanted William to believe. He told so many stories that he began to almost believe them for himself. Truth got lost in fiction, but not in a profitable way. I can't say that it was profitable because Bloom's tall tales ultimately separated himself from a right and good relationship with his wife and his son. The book is laid out in short vignettes. Each vignette is a short story from Bloom's past. It tells about the time he saved his town of Ashland, Alabama from a ravenously hungry giant. It documented his ability to outrun any man alive. One story tells about how he ripped the heart out of a mad dog when it was attacking a small girl. Another story tells how he saved a magic glass eye for an old woman. It was also boasted that he bought up an entire town just because he loved it and the people in it. (One woman in the story he loved a little too much - considering the fact that he was married.) Each story ranges in length from 2-5 pages which makes for a quick and easy read on the one hand. On the other hand, as you read you begin to feel and see how each story separated fact from fiction, giving him excuses to avoid responsibility as a husband and a father. Naturally the movie takes some liberties with the book, but in this case I don't think it mattered one way or the other. It left out the adulterous affair with the woman in the swamp but it added in another. It's kind of a 'six of one, half dozen of the other' situation. Pick your poison. Main message of the movie: Bloom was a great story teller. Main message of the book: Bloom was an absent father who was grasping at straws for how to connect with his son. The only problem is that he used the wrong sort of material to obtain the laughter he so longed to hear from his boy. "Never felt comfortable addressing these things head on," he says, moving uncomfortably beneath his sheets. "Who really knows for certain? Proof is unavailable. So one day I think yes, the next no. Other days, I'm on the fence. Is there a God? Some days I really believe there is, others, I'm not so sure. Under these less than ideal conditions, a good joke somehow seems more appropriate. At least you can laugh." There is just such a sense of desperation about this story - a son wanting to know a father who will not welcome him near him because he's afraid to feel. He relies on his jokes, his humor and his "likability." His son is less concerned with his father winning a popularity contest as he is in want of an actual father figure. It's sad, really. They lose their ability to have a true relationship because of Bloom's incessant need to crack smiles in all directions. William didn't want to just laugh with his father. He wanted to know him. Bloom was imbalanced. Relationship never existed as it cannot be expected to under such circumstances. I didn't walk away thinking that this book, this story, was such a great example of what it means to tell Tall Tales so much as it paints a picture of how we can separate ourselves from truth by making things up to guard ourselves. Instead of stories being used to bless and bind, they inadvertently were used to wound the very person he should have been working hard to know and love. It's pitiful and I mean that in the most sorrowful way. At the end of the movie tie-in edition of this book there is an interview by Wallace in which he says that although this book is entirely a work of fiction, the feelings that William has towards his father are real in the sense that Wallace didn't feel like he knew his father very well either. He says that the feelings expressed by William in the book are those of his own in relation to his father. Unfortunately, this is a story that I think has come across as being a means of entertaining ourselves with made up scenarios. Personally I think the message runs a little deeper than that. I think it's a story of parenting and how not to do it. Unfortunately, I think it's a message that far too many can relate to and maybe that's what draws people in to this book and movie in the first place. In which case, we should all be sad. Very sad. At the same time, we should all take note of how we tell stories. Truly good stories and laughter are quite a necessary part of life. But one must find the balance and use stories wisely, always pointing the listener and reader towards truth. When stories tell truth and bind us together, they are the most powerful force in swaying human hearts and minds. It's definitely something worth pondering and because of that, I'm ultimately glad that I read this book. I liked this movie! I didn't know there was a novelization of it, will hunt down a copy for myself. I love the movie and when I read the book afterwards was surprised by how much darker it felt. It's funny that you say you think the point of the movie is that Bloom was a great storyteller. I thought it was that even fabricated stories hold and element of truth. Even though the stories he told his son weren't true, they still revealed who he was. i.e. fiction is a lie that tells the truth. Thanks for the review, Carrie! I've heard of the movie, but I didn't know there was a book. I'm not sure if I'd like either one. excellent review. I did enjoy the movie when it came out, but also felt a bit uncomfortable with the theme of a neglectful father running away from the truth. It is probably because I knew a few tale tellers in my life and saw that same connection.